Combining fresh white brick and fieldstone exteriors in clean modern design is the row of specialty shops which extends from Franklin Simon to the corner of Hammond Street. 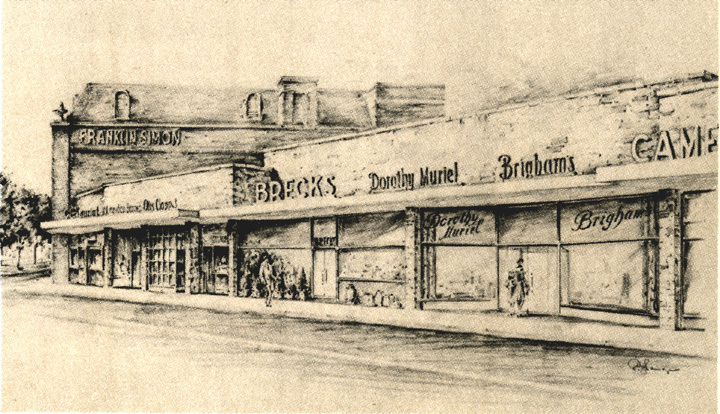 They include Pierre Marcel (beauty salon), Lauriat's Book Shop, The London Harness Company, Otis Clapp (Pharmacy), John H. Breck Company, (seeds and garden tools), Dorothy Muriels, Brighams, the Camera Shop, Howes Cleanser, The Package Shop, Thomas Long (jewelry), and the Star Market. June opening. Did you read about the February 15 opening of the new Franklin Simon Store out in Chestnut Hill? Well, that's just a taste of what's waiting for you in one of the most glamorous store developments to be found in the whole Northeast. And what's better . . . it's all within only a few steps of your B&W bus stop on the Turnpike, and quickly accessible from any of the areas we serve. The 11th Filenes unit is twice as large as any other branch of Boston's "fashion-right" store . . . and it has been designed "to give big store service". Two acres of floor space give a complete choice of smart new apparel for men, women, juniors and children . . . plus sportswear, accessories, home furnishings. Summer opening. A 103 years-old reputation for high quality merchandise is R. H. Stearns proud claim. And busy young matrons will be able to whisk the children in for a quick and easy outfitting, without tears or tiring. Fashions for Mom and Dad, too . . . plus linens, notions and fine home furnishings. June opening. World-famous S. S. Pierce will carry all the lines of high quality groceries, tobacco, perfumeries, etc., which made its reputation. In addition, you will find a complete new frozen food department . . . and, of course, the service for which it is noted. Clever murals make a gay setting here. June opening. The architects' drawings will give you an inkling of what's in store for you . . . crisp white and warm red exteriors . . . spacious and gay interiors ... all served up with an informal, friendly atmosphere to -make you feel right at home. There'll be air conditioning and radiant-heated sidewalks . . . big picture windows and lovely landscaping . . . the newest in fashions for the whole family, whether you want food, clothing, accessories or hobby supplies. Best news of all ... when the development is fully open, there'll be new jobs for at least 250 persons! Later, Filenes was added to the mix of stores. 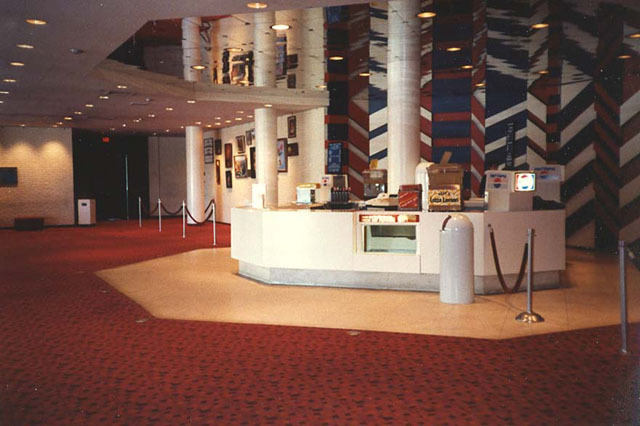 In 1975, this building became the headquarters for General Cinema Corporation, with a movie theatre located to the right of the original store entrance.